Over 4,000 members of the 1st BCT, 34th Infantry Division in a special formation for a farewell ceremony. The brigade combat team (BCT) is the basic deployable unit of maneuver in the U.S. Army. A brigade combat team consists of one combat arms branch maneuver brigade, and its assigned support and fire units. "The Brigade is normally commanded by a Colonel (O-6) although in some cases a Brigadier General (O-7) may assume command." A brigade combat team contains combat support and combat service support units necessary to sustain its operations away from its parent division. BCTs contain organic artillery support, formerly received from the division artillery (DIVARTY). The infantry brigade combat team, as of 2014, contains 4,413 soldiers and is organized around three battalions of infantry. Each type of brigade (light infantry, air assault, or airborne) has the same basic organization. Each infantry brigade is capable of air assault operations, whether or not it is officially designated as an air assault brigade. Also, most units typically maneuver in HMMWVs when deployed and operate as "motorized infantry" to facilitate speed of movement. The infantry brigade combat team consists of seven battalions: one cavalry, one brigade support, one engineer, three infantry and one field artillery. The Stryker brigade combat team (SBCT) is a motorized infantry force structured around the Stryker eight-wheeled variant of the General Dynamics LAV III. A full Stryker brigade was intended to be C-130 Hercules air transportable into theatre within 96 hours, while a division-sized force is expected to need 120 hours. The Stryker brigade is an organic combined arms unit of lightly-armored, medium-weight wheeled vehicles, and is organized differently from the infantry or armored brigade combat teams. The Stryker brigades are being used to implement network-centric warfare doctrines, and are intended to fill a gap between the United States' highly mobile light infantry and its much heavier armored infantry. The BCT Ground Combat Vehicle Program was the planned successor of the interim armored vehicle before being cancelled in 2014. The team also receives training in chemical, biological, radiological and nuclear defense (CBRN defense). Starting in 2015, the Anti-Tank Company was reflagged from the Brigade Engineer Battalion to the Cavalry Squadron, to form a Weapons Troop—also incorporating the Mobile Gun Systems from the Infantry Battalions. M1134 Anti-Tank Guided Missile Vehicle (ATGM) armed with a twin TOW missile launcher. The armored brigade combat team (ABCT) is the army's primary armored force. It was designed around combined arms battalions that contain both M1 Abrams tanks and M2 Bradley infantry fighting vehicles (IFVs). Other vehicles, such as HMMWVs and M113 armored personnel carrier, operate in a supporting role. In the future, it will also contain vehicles from the Future Fighting Vehicle and the Armored Multi-Purpose Vehicle. An armored brigade combat team consists of seven battalions: three combined arms, one cavalry (reconnaissance), one artillery, one engineer and one brigade support battalion. As of 2014, the armored brigade combat team is the largest brigade combat team formation with 4,743 soldiers. Prior to 2012, the armored brigade combat team was named the heavy brigade combat team. An ABCT includes 90 Abrams tanks, 90 Bradley IFVs, and 112 M113 vehicles. The operational cost for these combat systems is $66,735 per mile. The range of the Abrams limits the brigade to 330 km (205 miles), requiring fuel every 12 hours. The brigade can self-transport 738,100 L (195,000 gallons) of fuel, which is transported by 15 5,000-gallon M969A1 tankers and 48 2,500-gallon M978 tankers. In 2016, ABCT CABs adopted a triangle structure, of two armored battalions (of two armored companies plus a single mechanized infantry company) plus a mechanized infantry battalion (of two mechanized companies and one armored company). This resulted in the reduction of two mechanized infantry companies; the deleted armored company was reflagged to the Cavalry Squadron. The U.S. Army planned to implement elements of the BCT Modernization program in 2010. This program was planned to utilize elements from the Future Combat Systems program that was canceled in early 2009. The program came in two segments. The first to be implemented would be the Early Infantry Brigade Combat Team Capability Package (Early IBCT Package), which would modernize infantry brigade combat teams. The second to be implemented would be the Follow-on Incremental Capabilities Package, which could modernize all brigades. In July 2015, the Army announced the reduction of 2 additional BCTs as part of ongoing reductions to an end strength of 450,000. In addition to the reduction, one active Stryker BCT will convert to an infantry BCT, and its vehicles will be used to convert an Army National Guard BCT from armored to Stryker. In April 2017, the Army confirmed that the proposed downsizing of 4/25 (Airborne) BCT was being reversed, and the BCT retained. On 20 September 2018, the Army announced that the 1st Brigade Combat Team of the 1st Armored Division (1/1 AD) stationed at Fort Bliss, Texas, will convert from a Stryker brigade combat team (SBCT) to an armored brigade combat team (ABCT); and the 2nd Brigade Combat Team of the 4th Infantry Division (2/4 ID) stationed at Fort Carson, Colorado, will convert from an infantry brigade combat team (IBCT) to a SBCT. The conversion of the 1st Brigade Combat Team, 1st Armored Division, and the 2nd Brigade Combat Team, 4th Infantry Division, are planned to begin in the spring of 2019 and spring of 2020 respectively. ^ "Archived Document". Archived from the original on 12 October 2016. Retrieved 22 October 2016. 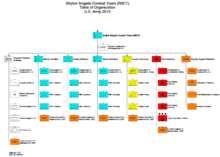 Organization: Operational Unit Diagrams:Brigade. Accessed 22 October 2016. ^ a b c "MCOE Supplemental Manual 3-90 (2015)" (PDF). U.S. Army. January 2015. Archived from the original (PDF) on 2 September 2017. Retrieved 2 September 2017. ^ FM 3-90.6 : Brigade Combat Team (PDF). Department of the Army. September 2010. Preface ("they can operate as part of a division or independently"), § 1-1 ("[BCTs are] the smallest combined arms units that can be committed independently"). Archived from the original (PDF) on 17 February 2013. ^ Pike, John. "FM 3-21.31 Chapter 1 Overview Of The Stryker Brigade Combat Team". www.globalsecurity.org. ^ Limardo, Jessica (12 February 2014). "Army unit trains to handle CBRNE threats". BioPrepWatch. Retrieved 20 April 2014. ^ Ashton, Adam (17 February 2014). "Stryker crews find ways to defeat armored enemy". Stars and Stripes. Retrieved 20 April 2014. ^ Dompierre, Mike (1st Lt) (1 July 2015). "2-1 Cav. stands up new weapons troop". Fort Carson Mountaineer. Retrieved 6 January 2017. ^ a b "Cavalry Brigade Combat Team assumes new design, transition nearly complete". U.S. Army. 17 February 2016. Retrieved 8 January 2017. ^ "Brigade combat teams cut at 10 posts will help other BCTs grow". army.mil. ^ "Archived Document". Archived from the original on 8 June 2012. Retrieved 26 August 2014. ^ Tan, Michelle (7 August 2017). "1st BCT inactivates as 2nd ID marks 50 years in Korea". armytimes.com. ^ "2nd ID unit in Korea to deactivate, be replaced by rotational force". stripes.com. ^ Polk, Leroy; Carpenter, Dan (7 April 2017). "Army intends to retain entire 4-25 brigade, deploy troops overseas". ktuu.com. Retrieved 13 July 2017. ^ a b c "Army announces conversion of two brigade combat teams". army.mil. U.S. Army. 20 September 2018. Retrieved 1 December 2018.